The washing machine is hardly out of everyday life indispensable because it facilitates the work of washing clothes immensely. However, the majority of people do not know that even the washing machines of high-quality brands such as Siemens, Miele or Bosch have to be regularly maintained. If you forget that, the technology will sooner or later strike so that the machine does not work as usual. In the worst case, this causes damage that can not be resolved and you have to buy a new device. Avoid this risk by regularly performing minor maintenance on your washing machine. What happens when the lint filter is clogged? Sure, it has happened to you once before, that you have the paper handkerchief in the Have overlooked trousers or washed down with change. Thanks to the lint filter, this is not too bad, because it prevents the small parts from getting into the drain pump of the machine and destroying it. Over time, however, too many foreign bodies collect in the sieve and prevent the water from draining out of the device as intended. Especially in households with pets, the lint filter is often blocked. The thick animal hair gets into the washing machine with clothes and gradually accumulates in the lint filter. Therefore, cleaning the strainer is especially common if your household is having hairy four-legged friends. There's an indication of a clogged lint filter if you want to get your laundry fuzzy out of the machine. Sometimes the foreign bodies in the lint filter also begin to mold, so that the laundry really stinks after the wash. In addition, you should check the sieve if your machine is buzzing or making other unusual noises when washing. How often should the sieve be cleaned? When asked how often the lint filter needs to be cleaned there are no universal answers. It depends heavily on whether you often forget paper towels in the laundry, whether you or other family members have long hair, if animals live in your household, if you often wear woolen clothing and which washing machine you own. To ensure that no water damage occurs or your machine fails, regular cleaning is on the program. Some washing machines and dryers will show an error code in the display when the lint filter needs to be cleaned. For some brands, you will also find instructions in the manual for the intervals at which cleaning should take place. We recommend that you remove the sieve at least twice a year and clean it thoroughly. Generally, however, it is better to clean once too often than once too little. In this way, you ensure that your washing machine will continue to serve you faithfully in the future. In addition, a clogged lint filter can also increase energy consumption, making regular cleaning twice as valuable. Once you have got all the utensils, cleaning can begin. Here's how to clean your fluff filter. Before you go looking for the lint filter, you should put the towel in front of the washing machine. So the running out water is absorbed. Then open the flap for the lint filter. It is usually located on the front of the unit in the lower left area. There you can feel on the left and right side two levers, which are pressed towards the middle. Then the sieve can be removed. On some washing machines, the round lint filter must also be removed. Now you should reach with your hands into the opening in which the sieve was previously screwed to remove the coarsest lint. Next, use the sponge or bottle brush to thoroughly clean the hole and remove all lint. You can clean the removed strainer either at the sink or in the bathtub. Be sure to use the hair sieve first so that your drain does not become blocked. Roughly clean the strainer with your hands under the running water. Then rub the outside with a cloth to remove most of the lint. If stubborn dirt gets caught, you can also use the shower head for cleaning. Often, it helps to add a little hair conditioner to make it easier to remove the lint. 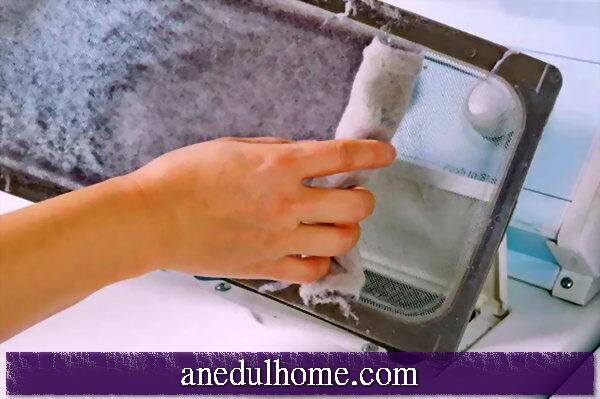 Once the lint filter is clean, dry it thoroughly and reinstall it in the opening of the washer. Close the strainer well, otherwise water could spill out! Then close the flap and let the machine run for a test. The lint filter is often underestimated, though it is an important detail of the Washing machine is. It captures all foreign bodies and prevents them from getting into the drain pump. The strainer must be cleaned regularly, otherwise it will clog and the machine will not work properly. To make sure nothing goes wrong with cleaning, there are a few tips to consider. What to do when burglars are in the house? Blowing out easter eggs - beware, salmonella danger!